Store Wars: Armageddon for Supermarkets but Let the Good Times Roll for Shoppers?! | Supermarkets in your pocket. Home › Discount › Store Wars: Armageddon for Supermarkets but Let the Good Times Roll for Shoppers?! Two weeks ago (May 6th), David Tyler Chairman of Sainsbury’s making the best of a bad job opined “our profitability and sales have shown good resilience relative to our listed peers”! In short, JS had lost less ground in sales and profitability than Tesco and Morrisons but red ink covered their preliminary results for 2014/15: retail sales down 2%; retail operating profit down 17.5%. Our view is that, rather than reassure the investors, he gave a terrifying insight into the mayhem that is the British grocery retail scene! Like-for-like sales have fallen like a stone for the 3 listed retailers over the past 6 years and, now, are firmly in negative territory. Why so? : the hard discounters Aldi and Lidl growing at the expense of mainstream supermarket retailers; a shift in shopper behavior towards on-line and convenience and going less frequently and buying less per visit from the “Big Box” stores; more canny purchasing in general and a preference for EDLP (Every Day Low Prices) rather than complex and confusing promotions; food price inflation falling from 4% at the beginning of the GFC (Global Financial Crisis) to zero or less in mid-2015; and the mainstream retailers falling over each other to “invest” in longer-term price cuts particularly for high profile KVI’s (known value items such as milk). The business model underpinning big supermarket chain profitability requires year-on-year sales growth. If sales falter, it is analogous to coming to an abrupt stop on a bicycle – in the absence of forward momentum, you fall over which is roughly what happened to Tesco! The big supermarket giants have little latitude to cut costs in the short- to medium-term other than through reducing staff numbers (and making the Thursday after work panic shop an even more frustrating and miserable experience than it is at present) and through squeezing suppliers even harder (and the pips are already squeaking). So, retailer profitability is tumbling cataclysmically (see graph). Now, all supermarkets are coming to terms with the consequences of over-investment in retail space over the past few years. In announcing its eye-watering loss of £6.4 billion, Tesco has written down property values by a staggering £4.7 billion (part and parcel of CEO Lewis’s attempt to clear the financial mess at one fell swoop – “kitchen-sinking it” as it is known in the trade!). Morrisons has written down the value of its property by a paltry £1.3 billion. Sainsbury’s reckons conservatively that 6% of its floor space is supernumerary and is trialing ventures with Argos (on-line general merchandise) and Jessops (cameras, etc.) to see if excess floor space can be rented out to what were competitors for non-food products. Free falling profit curves for the main retailers, at the moment. The most recent Tesco financial posts have been guardedly optimistic, albeit stressing the long road to recovery. Rightly so! The hard discounters have a combined grocery market share of around 10% and, arguably, taking another 5% from the “Big Boys” is not out of the question. At 6% share, on-line groceries are slowing their annual rate of growth but, still, reaching 10% or so is more likely than not and each percentage point pulls more sales from the creaking big store supermarkets. Discounters still enjoy a noticeable price gap with the main grocers. 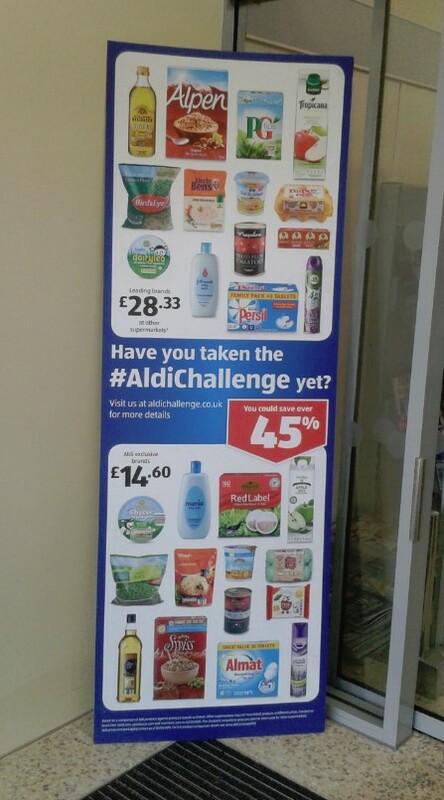 Aldi and Lidl continue to have a significant price advantage over their rivals. Another round of price wars may reduce this differential but it will have a concomitant negative impact on supermarket margins, too. The grocery market environment in the UK will continue to be a bloody battleground for the next couple of years and, like in any war, there will be casualties. One of the big 4 may well fall (perhaps, Morrisons, Sainsbury’s, or even the all-conquering Tesco of the pre-GFC era). ‹ When Choosing Your Grocery Shop, Fresh Matters Most!